The U.S. Congress created the National Park Service (NPS) in 1916 as a bureau of the Department of the Interior. Its purpose was to coordinate the administration for an increasing number of national parks. NPS objectives have evolved to include (1) preserving the natural and cultural resources and values of the parks, and (2) providing for public enjoyment of these areas while leaving them unimpaired. The diverse areas managed by the NPS—employing such professionals as foresters, naturalists, engineers, biologists, historians, geologists, archaeologists, rangers, and guides—are collectively known as the National Park System. As of 2002 it encompassed 384 areas, totaling about 33.8 million hectares (83.6 million acres) in 49 states, the District of Columbia, American Samoa, Guam, Puerto Rico, Saipan, and the Virgin Islands. The NPS engages in such activities as control of water pollution ; fire prevention and control; wildlife conservation ; and protection of natural, historic, or prehistoric features. In addition, it provides public services such as lectures, guided tours, and informational programs. The National Park Service administers over twenty types of areas that are categorized as natural, historical and cultural, and recreational. Areas dedicated to the preservation of natural features include national parks, rivers, preserves, and many of the monuments. Areas preserved for historic and cultural purposes include national monuments, military parks, battlefields, historical parks, and historic sites. Recreational areas include national seashores and lakeshores, and national recreation areas. Highly valued associated characteristics, such as scenic views. Environmental and historical education are offered by National Park Service rangers, naturalists, guides, and historians. 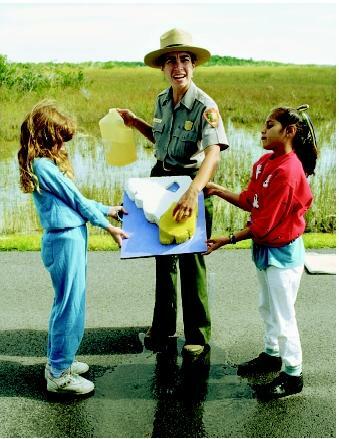 Here a ranger involves two young visitors while explaining the Florida Everglades' water resource system. As part of its administration, the NPS maintains the quality of its surface waters and groundwaters because they are critical components of aquatic and terrestrial ecosystems. Any pollution incidents from point sources and nonpoint sources are quickly resolved, knowing that such pollutants reduce visitor appeal to park waters. NPS regularly works with various government bodies in order to maintain or restore water quality as laid out under the federal Clean Water Act and other applicable federal, state, and local laws and regulations. Oftentimes, it is activities that take place outside park boundaries that have profound effects on the Service's ability to protect natural resources inside parks. In order to maintain the high standard of the park's natural resources many water-related systems are important: for example, floodplains, wetlands , watershed (drainage basin) and stream processes, and shorelines and barrier islands. The NPS is committed to protect, preserve, and restore the functions of floodplains. It manages wetlands in order to prevent destruction, loss, or degradation in compliance with NPS mandates and the requirements of Executive Order 11990 (Wetland Protection), the Clean Water Act, and the Rivers and Harbors Act of 1899, among others. The NPS manages watersheds as complete hydrologic systems, and minimizes human disturbance to the natural upland processes that deliver water, sediment, and debris to streams. These processes include runoff, erosion, and disturbance to vegetation and soil caused by fire, insects, weather events, and mass movements of earth materials. The NPS manages streams to protect processes that create habitat features such as floodplains, riparian systems, and natural pools. The National Park Service is an important partner in water management, especially given its responsibilities for many of the country's most precious wilderness areas. Water and aquatic resources are valued as an important natural resource in the NPS's planning and management activities. Scientists and resource managers are increasingly called upon to address disruptions of water resources that threaten the quality of life and environmental sustainability in U.S. national parks. SEE ALSO Beaches ; Clean Water Act ; Fish and Wildlife Service, U.S. ; Floodplain Management ; National Oceanic and Atmospheric Administration ; Pollution Sources: Point and Nonpoint ; Wetlands . Brandon, Katrina et al. Parks in Peril: People, Politics, and Protected Areas. Washington, D.C.: Island Press, 1998. Buccino, Sharon et al. Reclaiming Our Heritage: What We Need To Do To Preserve America's National Parks. Washington, D.C.: Natural Resources Defense Council Press, 1997. 2001 NPS Management Policies, Chapter 4: Natural Resource Management. National Park Service. <http://www.nps.gov/policy/mp/chapter4.htm> . History of the National Park Service. National Park Service. <http://www.cr.nps.gov/history/hisnps/NPSHistory.htm> . National Park Service: ParkNet. <http://www.nps.gov> . National Park Service, Water Resources Division. <http://www.nature.nps.gov/wrd> . Water Management: Everglades National Park. National Park Service. <http://www.nps.gov/ever/eco/h2omgmt.htm> . The largest National Park Service area is Wrangell-St. Elias National Park and Preserve in Alaska, containing 5.3 million hectares (13.2 million acres), or 16.3 percent of the entire National Park System. The smallest unit is Thaddeus Kosciuszko National Memorial in Pennsylvania, with 0.008 of a hectare (0.020 of an acre). In 1972, exactly 100 years after the first national park was created, the U.S. Congress made a similar commitment to protecting selected marine areas by establishing the National Marine Sanctuary Program. Since then, thirteen sanctuaries have been designated, representing a variety of ocean environments and one Great Lakes (fresh-water) area. The National Marine Sanctuary Program is administered by the National Oceanic and Atmospheric Administration, part of the U.S. Department of Commerce. Marine sanctuaries encompass deep ocean gardens, nearshore coral reefs, whale migration corridors, deep-sea canyons, and even underwater archaeological sites. They range in size from about 65 hectares (160 acres or 0.25 square mile) in Fagatele Bay, American Samoa, to roughly 1.37 million hectares (about 3.39 million acres or 5,300 square miles) in Monterey Bay, California, one of the largest marine protected areas in the world. For more information, see <http://www.sanctuaries.nos.noaa.gov> .